We enroll children year round! Our Redeemer Day Care Center is dedicated to meeting the needs of working parents by supporting them in the nurturing, growth and education of their children in accord with the Christian Faith. The Day Care staff is dedicated and loving. Majority of the staff members have taught in the center for four years or more. Following the New York State regulations, the Staff complete thirty hours of training every two years, including CPR and First Aid. The Day Care maintains a very good child/staff ratio in all rooms. We seek to offer affordable, extended child care which provides youngsters with a loving environment that meets and exceeds all their daily needs. We have a curriculum that emphasizes the development of a child's growth cognitively, physically, socially and emotionally. Our academic program fosters a foundation of learning for the child's future education. Children are well prepared for entering Kindergarten after graduating from our Pre-K program. 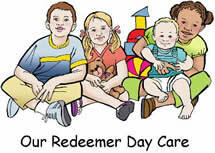 Our Redeemer Day Care Center is licensed by the Office of Children and Family Services. We are located between Sunrise Highway and Merrick Road, just south of Seaford Train Station. Our location makes us ideal for children living in Seaford, Bellmore, Wantagh, Massapequa, and Massapequa Park. For information about and/or tours of the Day Care, please call the director, Caitlin DiLemme at 516 781-8095 or email her at orschool@optonline.net for an appointment.